I wonder if contemporary children’s authors ever look at the writers of the past and think to themselves, “It was easier then. You could get away with so much more.” Morality, at least in retrospect, was so clear cut and uncomplicated in the books of the past. You could have a kid defeat a great big villain with relative simplicity and folks wouldn’t object at all. Or maybe not. That’s how we think of old children’s books… as simple. But when you try to sit down and think of all the realistic novels of the past, their conclusions are never as free and easy as all that. 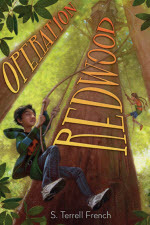 I’m mentioning all this because I just finished, Operation Redwood, one of the finest children’s novels of the year, and while reading the book I kept thinking about how author S. Terrell French never cheats her readers. She is constantly covering her tracks and making this a strangely realistic middle grade novel, albeit one about kids trying to take down a big business. It’s a first novel on the author’s part, but French has crafted an interesting, intelligent, and ultimately satisfying debut that will undoubtedly garner more than a few fans. A book that shows us that doing the moral thing is a complicated business. When I tell you that this is merely the opening paragraph to an incredibly well-thought out review that parses the book from soup to nuts, I hope you’ll understand how unusual and amazing that is. Please read the whole thing, and thank Betsy, when you get a chance, for introducing such considerate criticism into the kidlitosphere. ← But wait! There’s MORE great news! Wow, that's an awesome review. Congratulations! No problemo, darlin'. Just sad that it took me this long to pick the darn thing up. Thank goodness for multiple starred reviews, eh? I did read it yesterday and that very line caught my eye. What a compliment! That is so awesome! Congratulations to Ms. French and you! !